Which IT giant is the better dividend growth stock? Check out the latest Cisco and Intel earnings call transcripts. Do you like stability, dividends, and growth? 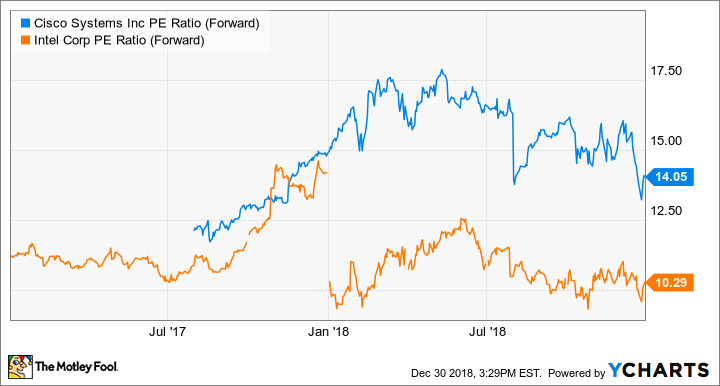 While many had written off giants Intel (NASDAQ:INTC) and Cisco (NASDAQ:CSCO) in recent years, both have responded impressively to the new world of IT, investing in technology and a healthy dose of acquisitions. Both Intel and Cisco held up pretty well in the marketwide sell-off in December and are two of the "safer" ways to play technology. Looking at each today, which is the better stock for your portfolio? Both Intel and Cisco have transformed themselves over the past few years. Intel is known for its dominant position in computer processor CPUs for PCs. At the same time, Cisco had traditionally been a dominant force in switches, which are pieces of hardware that direct traffic around a network. The problem for both companies is that these dominant positions were either slowing or at risk of being commoditized. In response, both have engaged in acquisitions. Intel bought Altera, a maker of field programmable gate arrays, in 2015, and then snapped up autonomous-vehicle software company Mobileye in 2017, in addition to a slew of smaller acquisitions over the past few years. Those moves have transformed the company from a pure CPU producer into a chip conglomerate that offers a one-stop shop for customers looking for either individual chips or entire multichip systems. Cisco, on the other hand, has always been famous for its acquisition strategy, and over the years it has similarly bulked up its wireless offerings, by buying Merkaki; cybersecurity, with Duo Security, Observable Networks, and Cloudlock; and application software, with AppDynamics, enhancing its "intent-based networking" vision. Cisco is hoping its bundled offerings will allow it to maintain its market share against lower-cost switching providers such as Arista Networks. Not only have both companies' profits benefited from tax reform and the repatriation of cash held oversees, but each company has also been able to grow its top line at surprising rates recently. CSCO Revenue (Quarterly YoY Growth) data by YCharts. Intel has reaped the benefits of resurgent IT spending, as the company's processors are necessary not only for PCs and laptops, but also for data centers that power cloud computing. IDC predicted that cloud spending would increase by 23.7% in 2018. That means lots of processors! In addition, Intel has benefited from an unexpected surge in PC demand, which has led to gains even in the "old" business of PC CPUs. On the other hand, it's also led to a shortage in the core CPU business. For Cisco, the company is also benefiting from increased data center spending, as many customers have gone with the company's Nexus 9000 series of data center switches, along with its Catalyst 9000 campus switches as enterprises upgrade their IT systems. Even with strong competition, Cisco is finding plenty of customers for its bundled security, switch, and software platforms. It's also begun offering its software by subscription, as opposed to an up-front license. 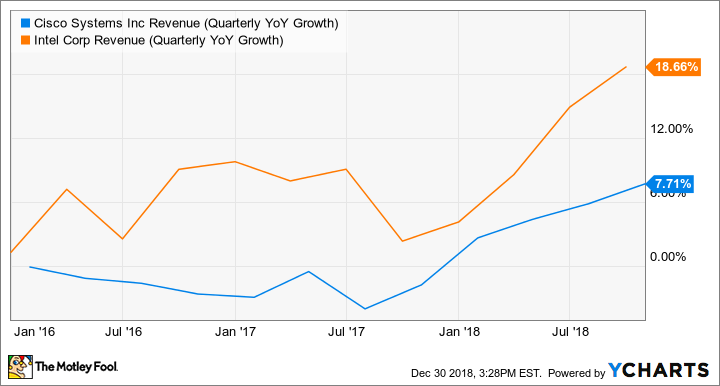 That decision limited the company's top-line growth in recent years, since some of the revenue was deferred, but now that Cisco is a few years into the transition, revenue is growing strongly again. Both companies are returning cash to shareholders through both dividends and share repurchases. Cisco is returning even more to shareholders than it's currently earning, because of 2018's change in overseas-cash repatriation laws. 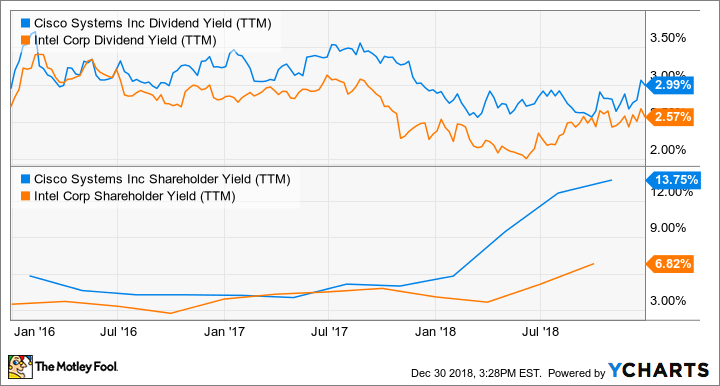 CSCO Dividend Yield (TTM) data by YCharts. Shareholder yield is dividends plus buybacks. So at least on the surface, it appears that although Intel is growing faster, Cisco is delivering higher levels of dividends and buybacks. Cisco also has a much better balance sheet than Intel, as its acquisitions have been a bit smaller than Intel's giant Altera and Mobileye acquisitions. 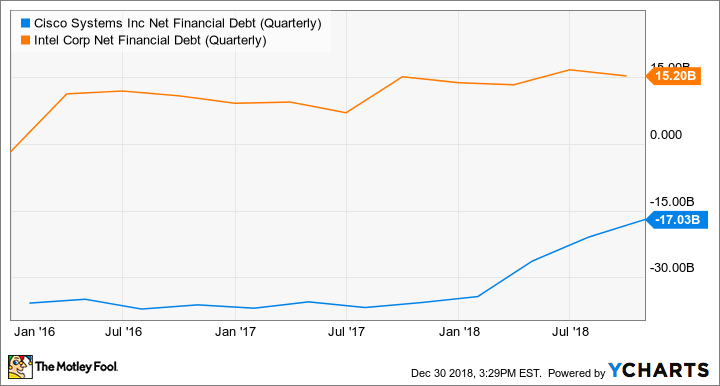 CSCO Net Financial Debt (Quarterly) data by YCharts. Negative financial debt means the company has net cash. But is Cisco really safer? It may appear from these two metrics -- shareholder return and net cash -- that Cisco is the safer bet. Yet Intel is currently being valued at a much lower forward price-to-earnings ratio. This could mean Intel is the better bargain. On the other hand, it could also mean investors believe Intel's growth prospects beyond 2019 are more at risk. CSCO PE Ratio (Forward) data by YCharts. Both Cisco and Intel can make great additions to a dividend growth portfolio for risk-off investors. For those looking for a bit more upside, I think Intel's higher growth and lower forward P/E are rather enticing. On the other hand, Cisco offers investors a higher dividend and better balance sheet, along with a healthy amount of buybacks, even with a slightly lower level of growth. For upside, go Intel. For safety and yield, Cisco is the play.